Carter was an absolute dream baby at fourteen days old. He slept through the entire session which allowed me to get through quite a few different poses and setups. This sage green backdrop is one of my favorites. It compliments his skin tone so beautifully and oh my goodness all of that thick, black hair! He must get it from his sister Jaylene because I couldn’t believe how beautiful she was either! At 13 years old I think she’s going to be an amazing big sister. Schedule your session early, while you’re pregnant is actually the ideal time! 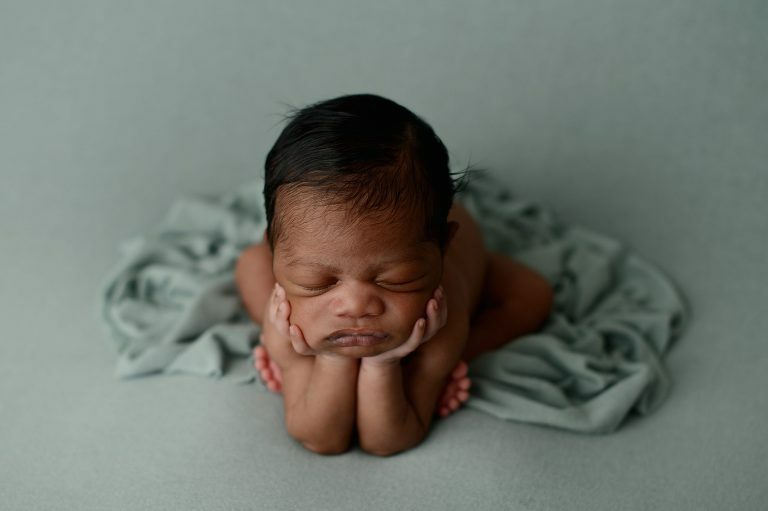 Especially because newborn photos should happen within the first couple weeks of life. Plan around your baby’s schedule. It’s best to take newborn photos while your baby is sleepy so nap time is ideal! Most babies have day and night confused, so they tend to be awake most of the night and very sleepy in the morning. Feed your baby prior to leaving home and expect them to be extra hungry throughout the session. 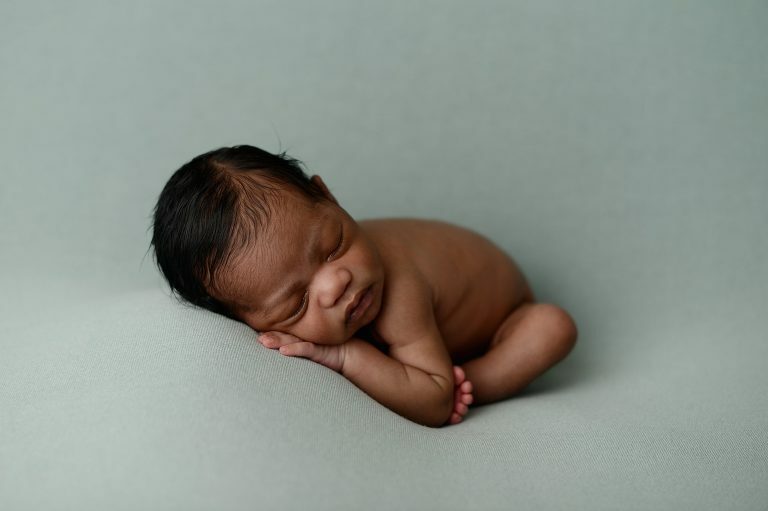 Even though they’re sleeping through it, newborn photography is a lot of hard work and they might be more hungry than usual. When they’re fussy and crying, I will feed them again. Expect to be a little warm. 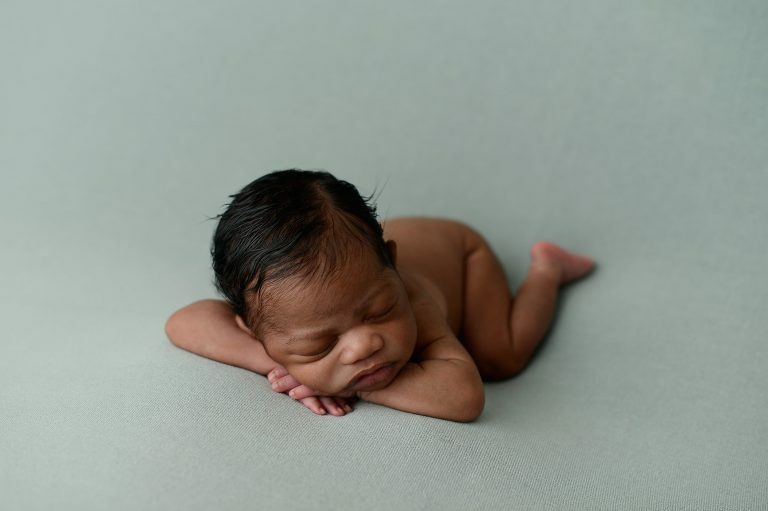 Warm and comfortable newborns are sleepy newborns so the studio is kept warmer for newborn photography sessions. Don’t forget the parents! 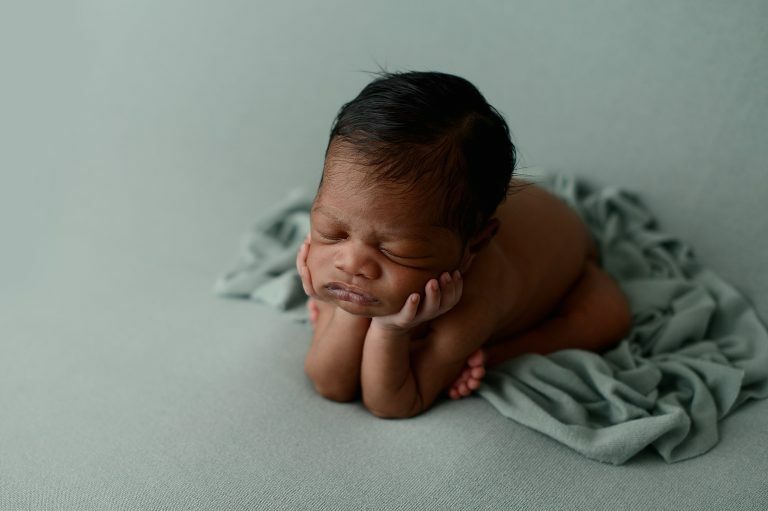 No newborn photo session is complete without you! I know it’s an exhausting time but be prepared to join the session. I want to see siblings too! Consider booking maternity and milestone sessions as a package with your newborn. Bring up any ideas or color schemes you might want at booking so I can have poses, backdrops and props ready. If you would like to know more about having a portrait session at Brilianna Photography, contact us for more information! Want to see more cute newborns? Check out Aria’s Newborn Photos.